Details: 2 BR, 2 BA Home, sleeps up to 6. 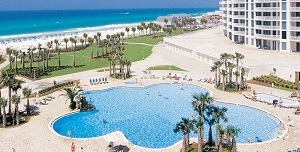 Destin beach resort home, Silver Shells condominium for rent – among the nicest, upscale beach resorts in Destin. Once you experience this popular complex, you’ll never want to go anywhere else for your Destin vacation. Silver Shells has an abundance of activities and amenities, there’s something for to everyone – park your car, relax and enjoy the best in beach living. Silver Shells community amenities include an exercise facility, heated indoor pool, outdoor pools, a sauna, a kiddie pool, hot-tubs, organized beach activities for the kids…basketball courts, tennis courts, billiards, a game room and more – plan the best beach vacation ever…visit have the best vacation ever at this Destin Florida Beach Vacation Rental Home.